Word lets you do all kinds of fun things with tables. Show off your organization and sorting talents by formatting and creating your table with Word’s Table tools. Tables organize text into rows and columns, which can make the text easy to type, edit, and format while spacing it correctly in your document. Tables organize text into cells, where a cell is the intersection of a row and a column. Click the Insert tab, click the Table icon, and then highlight the number of rows and columns for your table (up to a maximum of eight rows and ten columns). Use the Insert Table dialog box. 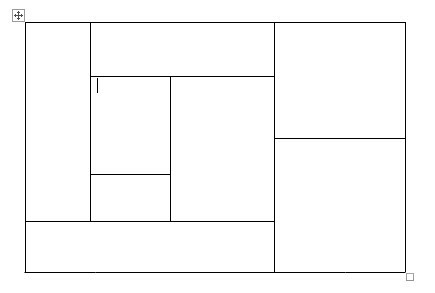 Draw the size and position of the table with the mouse. Convert existing text (divided by a delimiter character such as a tab or a comma). Move the cursor where you want to insert a table in your document. The Table pull-down menu displays squares that represent the number of rows and columns for your table. Move the mouse pointer to highlight the number of rows and columns you want to create for your table. When you highlight rows and columns, Word displays your table directly in your document so you can see exactly what your table will look like. Click the left mouse button when you’re happy with the size of your table. Move the cursor where you want to insert a table. The Insert Table dialog box appears. 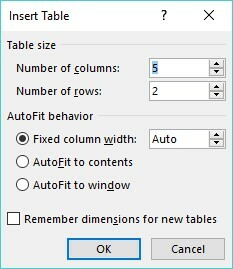 The Insert Table dialog box lets you specify an exact number of rows and columns. Click in the Number of Columns text box and type a number between 1 and 63, or click the up or down arrow to define the number of columns. Click in the Number of Rows text box and type a number or click the up or down arrow to define the number of rows. Word draws the table in your document. Drawing a table can be especially useful when you want to place a table in the middle of a page and create rows and columns of different sizes. Drawing a table with the mouse lets you create odd-shaped cells within a table. The mouse pointer turns into a Pencil icon. Move the mouse pointer where you want to draw your table, hold down the left mouse button, and drag the mouse to draw your table. Word draws a rectangular dotted box to show where your table will appear. Release the left mouse button when you’re happy with the size and position of your table. To draw vertical lines in your table, move the mouse pointer to the top or bottom of the table, hold down the left mouse button, and drag the mouse up and down. To draw horizontal lines in your table, move the mouse pointer to the left or right side of the table, hold down the left mouse button, and drag the mouse right and left to draw. Press Esc or double-click to turn the mouse pointer from a Pencil icon back to an I-beam pointer. 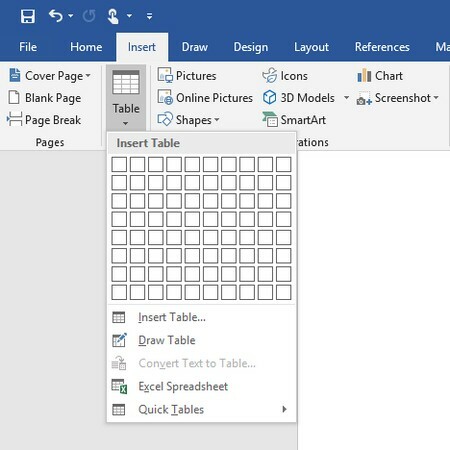 If you need to draw new lines on a table later, click anywhere inside that table, and the Table Tools Layout tab appears. Then click the Draw Table icon to turn the mouse pointer into a Pencil icon. Now you can draw new lines in your table. By using the same unique character to divide text, you can define how you want Word to define how much text to display in each individual cell of a table. Select the text that you want to convert into a table. Click the Convert Text to Table command. The Convert Text to Table dialog box appears. 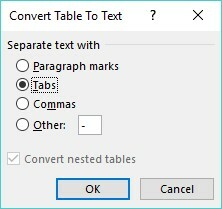 The Convert Text to Table dialog box defines how to convert your text into a table. Select a radio button in the Separate Text At group. Choose the option that corresponds to the way you divided your text. So if you divided your text by tabs, you would select the Tabs radio button. Word converts your text into a table. Click anywhere inside the table you want to convert into text. The Layout tab appears under the Table Tools heading on the far right of the Ribbon. Click the Layout tab under the Table Tools heading. The Convert Table to Text dialog box appears. The Convert Table to Text dialog box lets you specify how to divide a table. Select a radio button to define how you want to divide your table into text. After you create a table, you can format individual cells (spaces formed by the intersection of a row and a column) — or entire rows and columns — by aligning text in cells, resizing columns and rows, and adding borders, shading, or colors. All these changes can make the text inside the cells easier to read. Click in the table, row, column, or cell you want to modify. The Table Tools tab appears. In the Table group, click Select. The Select icon displays a pull-down menu. Choose an option, such as Select Row or Select Column. Word highlights your chosen item in the table. At this point, you can choose a command to modify the selected row or column (as when you choose a color or alignment). You can align text in a table cell in nine ways: top left (the default alignment), top center, top right, center left, center, center right, bottom left, bottom center, and bottom right. Tables can align text within cells in nine ways. Click in the cell (or select multiple cells) that contains text you want to align. In the Alignment group, click an alignment icon such as Top Right or Bottom Center. Word aligns your text. If you change the alignment of blank cells, any new text you type in those blank cells will appear according to the alignment you choose. By coloring rows or columns and adding borders, you can customize the appearance of your tables. However, it can be much faster to use a predesigned table style instead, which can automatically format your text, color rows, and add borders to your tables. Move the cursor inside the table you want to modify. Click the Design tab under the Table Tools tab. In the Table Style Options group, select or clear check boxes, such as the Header Row or Last Column check box. In the Table Styles group, click the More button. A pull-down menu of styles appears. As you move the mouse pointer over a table style, Word displays a live preview of your table formatted in the selected style. The Table Styles group displays different ways to format your table. Word formats your table according to the style you chose. You may need to resize a column or row in your table to expand or shrink it so your text doesn’t appear crowded or surrounded by empty space. 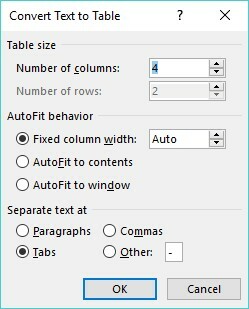 You can resize a column or row by using the mouse or by defining row heights and column widths. Click anywhere inside the table you want to adjust, then move the mouse pointer over the row or column border that you want to resize. The mouse pointer turns into a two-way pointing arrow. Hold the left mouse button down and drag the mouse to resize the row or column. Release the left mouse button when you’re happy with the size of the row or column. Select the row, column, or table that you want to modify. If you select the entire table, you can adjust the width or height of rows and columns for the entire table. Click the Layout tab under the Table Tools tab. Click the Width text box and type a value (or click the up or down arrow to choose a value). Click the Height text box and type a value (or click the up or down arrow to choose a value).